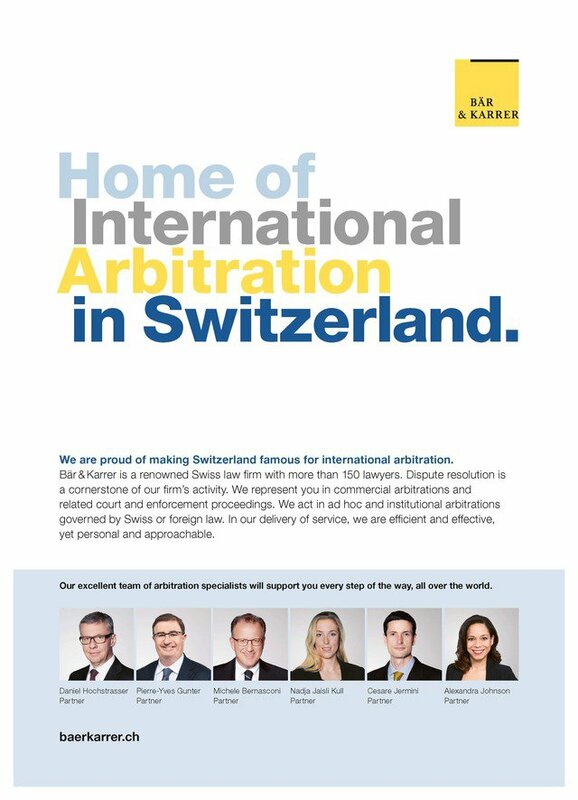 Founded in 1969, Swiss firm Bär & Karrer began to develop an international arbitration practice in the early 1980s. A key member of the group was Marc Blessing, a highly regarded arbitrator and honorary president of the Swiss Arbitration Association. Blessing retired as partner in 2007 but retains an of counsel role at the firm. Originating in Zurich, the firm opened offices in Lugano and Zug in the early 1990s, and Geneva in 2000. In arbitration terms, it has traditionally been seen as more of a force in the German-speaking part of Switzerland, with the majority of the team based in Zurich, including long-term practice head Daniel Hochstrasser. As of 2017, the practice is co-led from the Geneva office by Pierre-Yves Gunter, who joined after nearly two decades with GAR 100 firm Python. He brought with him a team that includes partner Alexandra C Johnson. In Zurich, the team includes partners Michele Bernasconi, who often sits as arbitrator in cases at the Court of Arbitration for Sport; and Nadja Jaisli Kull, who is a board member of the Swiss Arbitration Association. There is a small team in Italian-speaking Lugano, including Cesare Jermini, vice president of the Arbitration Court of the Swiss Chambers’ Arbitration Institution. In addition to its own client base, the firm is popular with international law firms looking for local co-counsel in a Swiss-seated arbitration. Clients of note include Sandoz (the generics division of pharmaceutical group Novartis) and the Swiss Broadcasting Corporation. It has also acted for Swedish telecoms operator TeliaSonera; Italian clients such as Ansaldo, Generali and pharma company Alfasigma; and Deutsche Telekom and German power utility Energie Baden-Württemberg. On the government side, it’s recently advised the Israeli state-owned Israel Electric Corporation, the National Iranian Gas Company and the Kingdom of Spain. Clients in the sports world include European football’s governing body, UEFA, and the Olympic Council of Asia. The firm has had some big wins. It helped French nuclear company Areva win more than US$920 million in a dispute with Siemens concerning a collapsed joint venture. For TeliaSonera it secured an award of US$932 million against Turkey’s Çukurova Holdings in an ICC dispute over a share purchase agreement, also defeating a mirror claim by Çukurova. The award has been the subject of enforcement proceedings in the US, UK, the Netherlands and the British Virgin Islands. In 2017, it helped Energie Baden-Württemberg prevail in an ad hoc arbitration worth US$1 billion, which had been brought by a German inventor in a dispute relating to waste-gasification technology. The claim against the client was dismissed in its entirety, with EnBW winning costs. The same year, it helped the Israeli state-owned Israel Electric Corporation defend a US$1.7 billion ICC award from a challenge by two Egyptian state entities before the Swiss courts. The award arose from the termination of a deal to supply gas from Egypt to Israel in the wake of the Arab Spring. Bär & Karrer was also part of a team that advised Ansaldo in a US$436 million dispute with Siemens over the licensing of gas turbine technology. In 2016, a tribunal dismissed Siemen’s claim and ruled that Ansaldo could use the technology and sub-license it to third parties in the China and South Korean markets. The firm also successfully defended a major Swiss pharmaceutical company against a US$120 million ICC claim by an Eastern European distributor and saw off a challenge to the award in the Swiss courts. It has helped UEFA win a dispute with FC Sion concerning the sanctions for use of non-eligible players in UEFA play-off games. Daniel Hochstrasser led a team that defended Deutsche Telekom in high-profile proceedings before the Swiss Federal Supreme Court, where India had sought to set aside an investment treaty award. The court held a public deliberation, one of the few times it has done so in an international arbitration case since 1989. It ruled by majority that the treaty extended to indirect investments such as the one Deutsche Telekom had made in India via a Singaporean subsidiary. In another notable matter before the same court, the team helped the Spanish government see off a challenge to a partial award in a €300 million dispute over a high-speed rail link between France and Spain. The decision allowed the arbitration to resume before a four-man tribunal. The firm helped Milan-based drugmaker Alfasigma settle a US$365 million ICC dispute with a Canadian pharma company over the development of a drug used to treat inflammatory bowel disease. There were some more high-profile instructions. Gunter and Johnson were instructed by the National Iranian Gas Company for an ICC dispute with Turkmenistan’s national gas company over an alleged US$1.54 billion debt for deliveries of Iranian gas. The pair already successfully acted for NIGC in a prior set of cases against a Turkish state entity while at their old firm Python. The firm won a US$20 million claim on behalf of a sport governing body in a TV-related commercial arbitration. Gunter has been chairing an ICC tribunal in a high-value ICC arbitration relating to the expansion of the Panama Canal, which has recently had hearings in Miami. Johnson joined the board at ArbitralWomen and the academic council of the Swiss Arbitration Association. Deutsche Telekom vice president Ina Roth commends the firm’s “hands-on approach” in the case against India (mentioned above). She praises Hochstrasser’s “focused advice” and availability, saying he “was very committed to the case.”. Another client in an ICC case applauds the firm’s “unparalleled knowledge of the ICC arbitration procedure, excellent skills to lead the arbitrators through complex commercial matters and the stamina to counter an opponent who tried to swamp us with filings”. Members of our arbitration team regularly serve as party-appointed arbitrators, sole arbitrators, and chairpersons of arbitral tribunals, as well as mediators. Partners of the firm are also active members of executive bodies of arbitral institutions (such as the Swiss Chambers). In addition they lecture on arbitration in LL.M. programs and specialized programs.